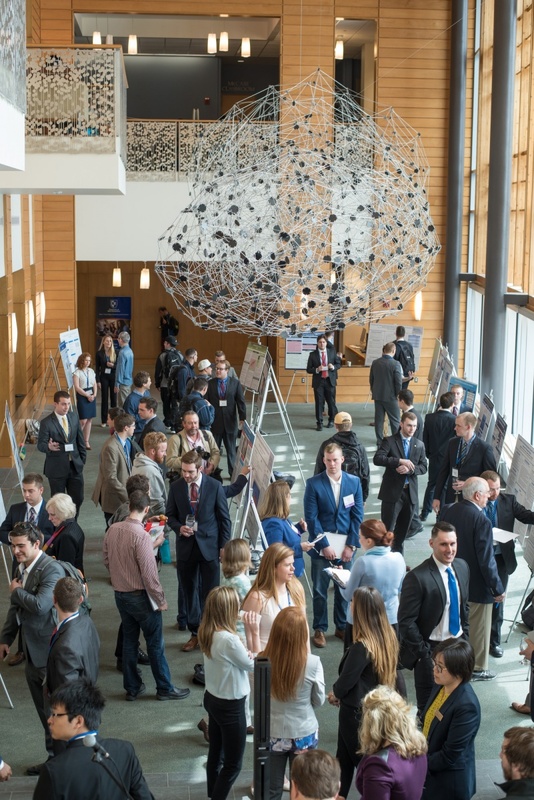 Economics majors at the UNH Peter T. Paul College of Business and Economics presented the results of their research projects during an Undergraduate Research Conference event Thursday. An internship that turned into a part-time job helped Conor McFarland '17 understand just how lacking affordable housing is in the state of New Hampshire, leading him to want to know more. And that led to his project, “The Scarcity of Affordable Housing in New England,” the results of which he presented at the Peter T. Paul College of Business and Economics Thursday during the 18th annual Undergraduate Research Conference (URC). “The most interesting thing I have learned during this project is that many states have extremely different housing climates,” says McFarland, a senior majoring in economics and minoring in Spanish. In fact, housing in New England is often twice as expensive as in other areas of the country. For the past 11 months, McFarland has been an intern at the New Hampshire Community Loan Fund (NHCLF) in Concord, where he works on the Resident-Owned Communities-NH (ROC-NH) program. His initial internship was part of the social innovation internship program through the UNH Center for Social Innovation and Enterprise. His work at NHCLF and the research he conducted for the URC helped increase his knowledge about such measures as housing vouchers and low-income housing tax credits (LIHTC ) that encourage development of affordable housing. McFarland also noted that affordable housing programs promote homeownership, provide access to capital and create more affordable housing options. “Community development financial institutions, community development corporations and other affordable housing initiatives are crucial for preserving workforce housing in New England,” McFarland says. A New Hampshire resident, McFarland also participated in the 2016 Social Venture Innovation Challenge. He is pursuing a full-time job with New Hampshire Community Loan Fund.